The texture in this pale cotton fabric is superb and the coloring is creamy with a traditional pattern hand printing from fermented african mud. I have settled on the idea of using this bespoke cloth to upholster a bedhead for our guest bedroom. This monochrome simple, yet captivating pattern will make the perfect backdrop for a layered bed. Although usually translated as “mud cloth,” Bògòlan is the traditional name for this printing technique. It refers to a clay slip with a high iron content that produces a black pigment when applied to hand spun & handwoven cotton textiles. In traditional bògòlanfini production the men weave the cloth and the women dye it. These beautiful cloths are created on narrow looms using strips of cotton fabric about 15 centimetres (5.9 in) wide. They are then hand stitched together with the seams visible into larger cloths and range in sizes. To source the perfect piece of Mali Mud cloth for your next project, try these places, Water Tiger , Few and Far and Hendrix & Harlow. You can also alway just search on Etsy or Ebay. My Ideas for your Mali Mud Cloth: Cushions, upholstered chair or ottoman, tablecloth, bedhead, wall hanging, framed art or even use the cloth to update a lampshade. 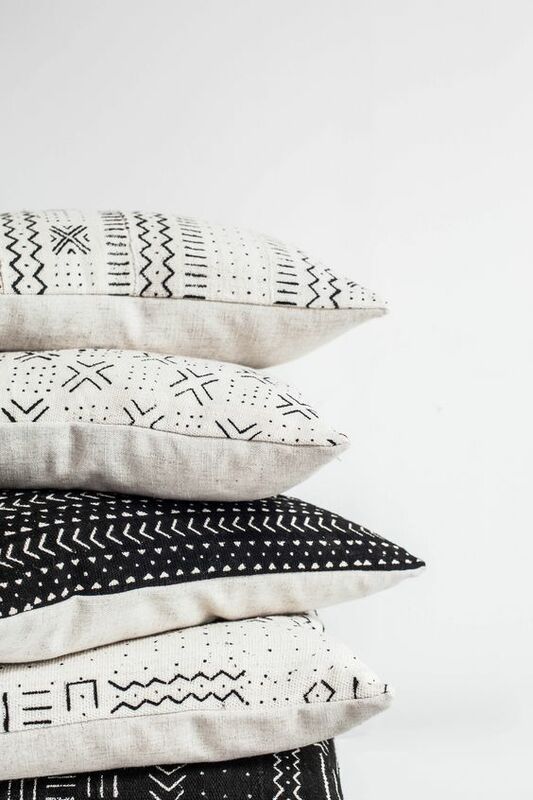 *A great trick to stretch the fabric twice as far when making cushions is to use a plain fabric to back the cushions and use your special Mali Mud Cloth only for the fronts.